Figure 1. Port and cart placement for robotic right hepatectomy. A, Port placement: (1) optical port, (2) 8-mm trocar for the right operating arm, (3) 8-mm trocar for the left operating arm, and (4) 8-mm trocar for the fourth robotic arm. A indicates assistant port; B, Robotic cart placement. Figure 2. Section of the right hepatic artery between ligatures during hilum dissection. Figure 3. Dissection and suturing of branches from the right portal vein directed to segment 1 during hilum dissection. Figure 4. During hilum dissection, the right portal vein has been clipped, and selective stitches of polypropylene are applied on the proximal part. The numbers 1 and 3 represent the robotic arms that are in use. Figure 5. Suturing of the right hepatic duct during hilum dissection. Figure 6. Intraoperative view during hepatocaval plane dissection. The numbers 1 and 3 represent the robotic arms that are in use. IVC indicates inferior vena cava. Figure 7. Liver parenchymal transection shows exposure of the transection line by the fourth robotic arm with polypropylene stitches at the left resection margin. The numbers 1 and 3 represent the robotic arms that are in use. Figure 8. Intraparenchymal transection of the right hepatic vein with an endoscopic stapler. Just Because You Can Doesn't Mean You Should . . . Because Many of Us Really Can’t! Hypothesis Robotic surgery for performance of right hepatectomy is safe and effective. Design Case series from 2 medical institutions. Setting University of Illinois at Chicago and Misericordia Hospital, Grosseto, Italy. Patients Twenty-four patients underwent right hepatectomy between March 1, 2005, and January 31, 2010, using a robotic surgical system. Main Outcome Measures Intraoperative blood loss, operative time, morbidity, mortality, and long-term oncologic follow-up. Results The procedure was converted to open surgery in 1 patient (4.2%). The overall mean (SD) operative time was 337 (65) minutes (range, 240-480 minutes), and the mean (SD) intraoperative blood loss was 457 (401) mL (range, 100-2000 mL). Three patients (12.5%) underwent blood transfusion. There were no perioperative deaths and no reoperations. Six patients (25.0%) experienced postoperative morbidity, including transitory liver failure in 2 patients and pleural effusion, bile leak, fluid collection, and deep venous thrombosis in 1 patient each. The patients' diagnoses included colorectal liver metastases (n = 11), noncolorectal liver metastases (n = 4), hemangioma (n = 4), adenoma (n = 2), hepatocellular carcinoma (n = 1), hepatoblastoma (n = 1), and biliary amartoma (n = 1). At a mean follow-up duration of 34 months, no port site metastases were observed in patients with malignant pathologic findings. Conclusions The zero mortality and acceptable morbidity of our series indicate that in experienced hands, robotic right hepatectomy is feasible and safe. Robotic surgery offers a new technical option for minimally invasive major hepatic resections. Long-term results seem to confirm oncologic effectiveness of the procedure. Laparoscopic liver surgery has long been recognized as one of the most challenging procedures in the field of minimally invasive surgery.1 However, as surgeons continue to gain more experience with laparoscopy and as new technological devices become available, the number of laparoscopic liver resections being performed is gradually rising.2 Its benefits have been reported in studies3-6 comparing laparoscopic with open liver surgery and include a significant decrease in intraoperative blood loss, reduced postoperative hospital length of stay, and shortened time to first oral alimentation. For patients with chronic liver disease, laparoscopic liver resection has been associated with lower overall and liver-specific complication rates compared with open surgery.7 As a result, studies8-15 since 2004 have demonstrated the safety and feasibility of major laparoscopic liver resections. The objective of this study is to describe our experience with robotic right hepatectomy using a robotic surgical system (da Vinci Surgical System; Intuitive Surgical, Inc, Sunnyvale, California). We focus herein on our technique and outcomes. Between March 1, 2005, and January 31, 2010, a total of 24 patients underwent robotic right hepatectomy by one of us (P.C.G.) who is an experienced surgeon21 at 2 medical centers, the Department of General Surgery at Misericordia Hospital in Grosseto, Italy (March 2005 to April 2007) and the Division of General, Minimally Invasive and Robotic Surgery at the University of Illinois at Chicago (May 2007 to January 2010). Demographics, intraoperative outcomes, mortality, 30-day morbidity, and follow-up data were collected prospectively in 2 separate databases kept at each institution and retrospectively analyzed for this study. The patients' clinical status and characteristics of liver lesions were the basis of selection for a robotic approach during the study period. Exclusion criteria included general contraindications to pneumoperitoneum, cardiac or respiratory insufficiency, or American Society of Anesthesiologists classification exceeding 3. Liver resection for benign tumors was considered when symptoms or adenopathy were present or when a malignant neoplasm could not be excluded during the preoperative workup. Resection of liver metastases was considered only in the absence of peritoneal carcinomatosis and nonresectable extrahepatic disease. There was no limit on the size of lesions. However, lesions with extensive subcapsular involvement or those invading major hepatic vessels (portal vein branches, inferior vena cava, and major hepatic veins) were considered contraindications. The need to perform a biliary reconstruction during right hepatectomy was not considered a contraindication during the last 2 years of experience reported in 2010.20 All patients were fully informed of the risks and benefits of the procedure, and written informed consent was obtained before surgery. All procedures were performed using the robotic surgical system. The variables analyzed in this study include operative time, intraoperative blood loss, resected tumor size, postoperative hospital length of stay, morbidity, and mortality. Morbidity and mortality were defined as occurring within 1 month of surgery. Continuous data were expressed as the mean (SD). To compare groups, t test was applied to continuous data and Fisher exact test to categorical data when appropriate. P < .05 was considered statistically significant. The patient is placed supine in a 20° reverse Trendelenburg position with the operating table tilted slightly to the left side. Pneumoperitoneum is achieved through a Veress needle in the left hypochondria to insufflate the abdomen to 14 mm Hg. Six trocars are typically used for the procedure as shown in Figure 1, which illustrates 4 trocars in use and 2 points (marked with red dots) indicating future trocar entry sites. The robotic surgical system's patient cart is placed at the patient's head for the docking phase. The first surgeon is seated at the robotic console, while an assistant surgeon who is experienced in advanced laparoscopic surgery stands at the patient's side. The assistant surgeon is positioned between the patient's legs to allow for changing of robotic instruments and to perform retraction, clipping, stapling, suction, and laparoscopic ultrasonography. A second assistant surgeon is positioned on the right side of the patient. Retrograde cholecystectomy is performed, and dissection of the hepatic pedicle is started using a combination of monopolar hook and bipolar forceps. The right hepatic artery is dissected first and then sectioned between ligatures (Figure 2). The right portal vein is then completely dissected. Selective stitches or ligatures are applied on the small posterior branches for segment 1 (Figure 3), and the right portal vein is divided between robotic clips and immediately sutured with stitches of polypropylene 5-0 (Figure 4). Extrahepatic dissection of the right bile duct is accomplished only when the anatomy is clear and the confluence of the biliary duct is low. In this case, once the hilar plate is lowered, the right hepatic duct is isolated and transected 1 cm from the bifurcation (Figure 5). In other cases, the right biliary duct is divided during parenchymal transection. An anterior approach is generally used for robotic right hepatectomy. This phase begins with dissection of the lateral peritoneal reflection along the hepatocaval plane. The inferior surface of the liver is then lifted up using the fourth-arm instrument. The right flank of the inferior vena cava is exposed, and dissection of the inferior vena cava is performed by working along its axes from beneath the liver and sectioning multiple accessory hepatic veins between ligatures or transfixed stitches of polypropylene (Figure 6). If needed, clips can be used to further secure the proximal ligatures. Once the inferior aspect of the right hepatic vein is visible close to the diaphragm, dissection of the inferior vena cava is complete. To obtain complete visual control of the right hepatic vein, the portion of the falciform ligament that is covering the right hepatic vein is dissected. Parenchymal transection is then carried out along the cholecisto-caval line, following the ischemic demarcation and beginning at the anterior border of the liver. This is performed using a combination of robotic harmonic shears (Intuitive Surgical, Inc) on the right arm and bipolar forceps on the left arm. Optimal exposure of the transection surface is progressively achieved by several polypropylene stay sutures placed at the left resection margins used for retraction by the fourth arm (Figure 7). Transection of the cortical aspect of the liver continues layer by layer using robotic harmonic shears. Minor bleeding is controlled via bipolar cautery, while the larger vessels are controlled with selective stitches of polypropylene 4-0. The second phase of parenchymal transection involves the section of the core of the liver parenchyma. This is represented by the part of the liver in which there is higher vascularity because of the venous branches from segments 5 and 8 that are directed toward the middle hepatic vein. In this phase, endoscopic staplers are used for parenchymal transection. The right hepatic vein is divided inside the parenchyma using a laparoscopic vascular stapler (Figure 8). The lateral ligaments of the liver are normally taken completely down at the end of the procedure. The specimen is then placed in an endoscopy bag and extracted through a Pfannenstiel minilaparotomy. Two closed suction drains are left in the subhepatic and subdiaphragmatic areas, and pneumoperitoneum is vented through the trocar. In this study, 24 patients who underwent robotic right hepatectomy were analyzed. The first group of 13 patients (54.2%) underwent robotic right hepatectomy at the Department of General Surgery at Misericordia Hospital in Grosseto, Italy (March 2005 to April 2007), while the second group of 11 patients (45.8%) underwent robotic right hepatectomy at the Division of General, Minimally Invasive and Robotic Surgery at the University of Illinois at Chicago (May 2007 to January 2010). Of 24 procedures performed, all but 1 (95.8%) were successfully completed robotically. One conversion to open surgery was necessary owing to adhesion of the colorectal metastases to the inferior vena cava, making it impossible to safely evaluate the oncologic margin. Demographics of the patients are summarized in Table 1. Of 24 patients undergoing robotic right hepatectomy, 14 (58.3%) were women. The median age was 55 years (age range, 21-84 years). Eighteen patients (75.0%) had undergone previous abdominal surgery. Indications included malignant tumors in 17 patients (70.8%) and benign tumors in 7 patients (29.2%) (Table 2). Five patients (20.8%) had secondary procedures performed in addition to right hepatectomy (Table 3). The overall mean (SD) operative time was 337 (65) minutes (range, 240-480 minutes), and the overall mean (SD) intraoperative blood loss was 457 (401) mL (range, 100-2000 mL). Blood transfusions were required in 3 patients (12.5%). There was no mortality in our series. Morbidity occurred in 6 patients (25.0%). Of these, 5 were in the first group of 13 cases, and 1 was in the second group of 11 cases (P = .17). Transitory liver failure (50-50 criteria22) was observed in 2 patients who received preoperative chemotherapy. One bile leak occurred and was treated by percutaneous drainage. All patients were ambulating by the end of the first or second postoperative day. Oral alimentation was restarted at a mean of 2 (1) days after surgery. There was no incision-related morbidity. The overall mean (SD) postoperative hospital length of stay was 9.0 (3.0) days (range, 3-23 days). Comparing the 2 groups of patients, the postoperative hospital length of stay was significantly shorter in the US group than in the Italian group (5.5 [2.0] vs 11.0 [5.0] days, P = .003). Three patients in the Italian group had a postoperative hospital length of stay exceeding 20 days because of liver failure, pleural effusion requiring thoracic drainage, and deep venous thrombosis. The overall median size of lesions was 52 (28) mm (range, 10-110 mm). The mean surgical margin was 30 mm (range, 3-70 mm). Only 1 patient had a margin less than 1 cm. The mean follow-up duration was 34 months (range, 1-57 months). No port site or peritoneal metastases were observed in patients with malignant pathologic findings. Among patients with colorectal liver metastases, 9 of 11 are alive and disease free at a mean follow-up duration of 36 months (range, 1-57 months). Two of these patients manifested new colorectal liver metastases in segments 3 and 2 after right hepatectomy at 10 and 20 months, respectively. They underwent a second liver resection and are alive and disease free. Another patient is alive 12 months after surgery and is undergoing chemotherapy to treat bilateral pulmonary metastases. One patient with rectal cancer developed cerebral metastases 9 months after surgery and died 3 months later. Four patients had noncolorectal metastases. The first patient, with liver metastases as a result of melanoma, died 9 months after surgery of cerebral and pulmonary recurrences (no new liver recurrences were detected). The second patient, with liver metastases as a result of endometrial cancer, underwent left colectomy for colonic cancer 10 months after liver resection and is alive and disease free. The third patient had breast cancer liver metastases and is alive and disease free 38 months after surgery. The fourth patient, with liver metastases from pheochromocytoma, developed 2 new liver metastases in the left lobe 13 months after surgery. These were treated using percutaneous radiofrequency ablation. One patient with hepatoblastoma developed cerebral metastases 19 months after surgery and died 2 months later. Finally, 1 patient with hepatocellular carcinoma (on steatotic liver) is alive and disease free 6 months after surgery. 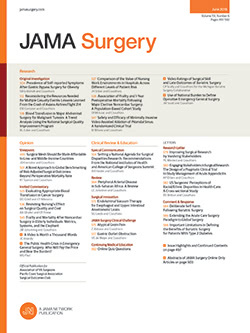 Although reports of laparoscopic minor liver resections have increased with experience and availability of new technological devices, the fear of major intraoperative bleeding and technical difficulties because of a lack of advanced laparoscopic skills have limited the use of minimally invasive surgery for major liver resections. In a large systematic review of the literature, Nguyen et al2 found that, of 2804 laparoscopic liver resections performed between 1992 and 2008, only 253 (9.0%) were right hepatectomies. Likewise, Dagher et al23 in a 2009 multicenter study on laparoscopic major liver resections reported 136 minimally invasive (hand-assisted and totally laparoscopic) right hepatectomies performed over 11 years at 6 international (3 European, 1 US, and 1 Australian) centers. Studies10-12,14,24 have shown that in experienced hands, laparoscopic major right liver resection offers reductions in intraoperative blood loss, blood transfusion rates, and postoperative hospital length of stay. However, it is performed in only a few centers worldwide. The experience with robotic surgery for major liver resection reported thus far in the literature remains limited. An initial study16 of robotic anatomic liver resection was published by our group in 2003. That same year, Vibert et al17 reported a case of an extended robotic right hepatectomy in which the robot was used to perform the hilum dissection and part of the parenchymal transection. In 2009, Patriti et al19 reported their initial experience with 7 patients in whom synchronous colorectal liver metastases were treated using robotic surgery. In this series, only 1 patient underwent right hepatectomy, although a right subcostal incision was made for completing the hemostasis and extracting the specimen. From a technical point of view, the use of a robotic surgical system can improve certain steps of minimally invasive right liver resection. Magnified 3-dimensional vision allows for better definition of the vascular anatomy and improved recognition of the fine branches that originate from the right portal trunk and are directed toward segment 1. Furthermore, by taking advantage of the wristed instruments, it is possible to use simple ligatures to control major vessels instead of the stapler, which can be cumbersome in small spaces. In our experience, extraparenchymal dissection and selective control in elements of the right portal pedicle were possible in all cases, with no intraoperative accidents. Furthermore, in 1 case of high intraportal bifurcation, intraparenchymal dissection (an anterior split) enabled safe recognition and control of portal branches. Hepatocaval dissection can also be improved by the use of a robotic surgical system. The dissection can be completed by working along the main axis from beneath the liver and increasing progressively the traction on the fourth arm. In a limited workspace, the availability of instruments with wristed technology can allow for precise dissection and suturing of the accessory hepatic vein. It is important to note that with this type of advanced procedure, it is mandatory to have an experienced assistant surgeon present. He or she can assist in suctioning and retracting the tissue to obtain optimal exposure. Intraoperative bleeding during parenchymal transection is a primary reason for conversion to open surgery during laparoscopic major liver resections.2,23 The reported conversion rate for laparoscopic right hepatectomy varies from 33% in the early experience by Dulucq et al13 to a more limited rate of 14% reported by Gayet et al.12 In our experience, only 1 conversion to open surgery occurred. This was because of inability to carefully evaluate the oncologic margin. Conversion to open surgery was considered mandatory to avoid compromising the oncologic outcome of the operation. Some authors have adopted the use of the Pringle maneuver for major liver resection to prevent possible bleeding.13,14,25 In our experience, the Pringle maneuver was not necessary. The mean intraoperative blood loss was 457 (401) mL (range, 100-2000 mL), and 3 patients underwent blood transfusion. These overall intraoperative blood loss and blood transfusion data are comparable to those reported in other series of laparoscopic right hepatectomy.12,15,23 In particular, Dagher et al15 in their series of 20 laparoscopic right hepatectomies reported a blood transfusion rate of 15%, with a mean intraoperative blood loss of 523 (526) mL. A similar rate was reported by Gayet et al12 in their series of 42 laparoscopic right liver resections, with a 14% blood transfusion rate. With regard to morbidity and mortality, our study reports 25.0% (6 of 24) morbidity and zero mortality. The morbidity rate was higher in the first group of patients because of 2 transitory liver failures and can be attributed less to surgical technique and more to extensive preoperative chemotherapy26 that both patients received. Regarding long-term oncologic outcomes, 3 of 17 patients with malignant disease had liver recurrences, and 2 died of systemic recurrence. However, type of recurrence does not seem to be associated with surgical technique (far away from the section line). A controlled trial is needed to compare the long-term oncologic results of robotic right hepatectomy with those of open surgery. In conclusion, minimally invasive surgery has a clear role in major liver resections at experienced centers, offering the patient decreased abdominal wall morbidity, shorter postoperative hospital length of stay, and minimal need for blood transfusion. The acceptable morbidity and low blood transfusion rate in our series indicate that robotic right hepatectomy is feasible and safe in experienced hands. This technique may represent a future minimally invasive approach to major liver surgery. Accepted for Publication: June 7, 2010. Correspondence: Pier Cristoforo Giulianotti, MD, Division of General, Minimally Invasive and Robotic Surgery, Department of Surgery, University of Illinois at Chicago, 840 S Wood St, Ste 435E, Chicago, IL 60612 (piercg@uic.edu). Author Contributions:Study concept and design: Giulianotti. Acquisition of data: Sbrana, Coratti, Bianco, Addeo, and Buchs. Analysis and interpretation of data: Coratti, Bianco, Buchs, and Ayloo. Drafting of the manuscript: Giulianotti, Bianco, Addeo, and Buchs. Critical revision of the manuscript for important intellectual content: Giulianotti, Sbrana, Coratti, Bianco, Addeo, Ayloo, and Benedetti. Study supervision: Giulianotti, Sbrana, Coratti, Addeo, Ayloo, and Benedetti.